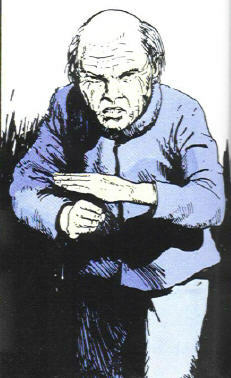 Powers/Abilities: Teng is a master of Kung Fu, as well as being a Feng Shui Man, which apparently enables him to gain glimpses of a person's future from that person's face. According to Rick Mason, he is "...a Feng Shui Man. A Geomancer....the equivalent of a priest, a fortune teller, a doctor, and a psychiatrist all rolled into one." History: The source of Teng's training, as well as most of his past history, remains unrevealed. (Agent GN(fb)-BTS) - Approximately ten years ago, Teng trained Rick Mason in the martial arts. (Agent GN(fb)-BTS) - Teng Yun-Suan became associated with the Kingpin of Crime, who acted as his financial partner in a plot to use super-human agents in a series of coups to gain control of small countries, in order to start a power base for grander schemes. He set Dog and his allies up to take over Hong Kong. (Agent GN(fb)-BTS) - Teng hired Black Metal and his allies to take over the country of Costa Brava and oust the right wing dictator. (Agent GN) -Rick Mason investigated a plot to overthrow the government of Hong Kong. He uncovered the involvement of Dog and several other superhuman former agents of the Chinese government (Gold, Horse, Monkey, She-Devil, Silver), all working for an unknown party. Horse attacked Mason and was killed in the ensuing struggle. Mason was next hired by Nick Fury to investigate similar events in the country of Costa Brava, and he brought down the group led by Black Metal. Teng then revealed himself as the mastermind behind the various super-villain coups and attacked Mason, but the Agent killed him in combat. Teng was proud that his former student had become his superior. Comments: Created by James D. Hudnall and John Ridgway. Master Planner, an alias used by Doctor Octopus, @Amazing Spider-Man I #30. Master Programmer, an digitized version of Dr. Octopus, @Amazing Scarlet Spider #1.